To better explain, I asked Susan how she prefers to interact, both professionally and personally. Familiar platforms like iMessage, Facebook Messenger, Instagram, SMS, WhatsApp were her first choices. For Susan, it became obvious why response rates dwindled and campaigns were falling short. Like her members’, she enjoys the convenience of communicating through messaging platforms. It is undeniable smartphones and 24/7 connectivity is driving this movement. Further, the transformation is ubiquitous, with messaging being the most widespread way to communicate nationally and globally. Recent studies show texting is now essential to commerce. In 2015, 451 Research reported the growing trend of business-to-consumers preference for mobile messaging. Over the last 10 years, the world has seen a rapid technology evolution and a high demand for messaging functionality. If it is so obvious, what is stopping Susan and every other bank, credit union, or financial advisor from adopting text messaging? Marketing leaders are victims of using tools of the trade that are no longer as effective as they once were. Look at recent email campaign open and response rates. What do you see? Today, an email open rate above 20% is considered high. A response rate of over 5% is deemed successful. Now, look at the same statistics for text messaging. An overwhelming 98% of marketing texts are opened, with almost half of those texts being responded to. Shastic ran the response rate numbers among their financial services partners and found a 70% text messaging response rate from their online loan applicants. 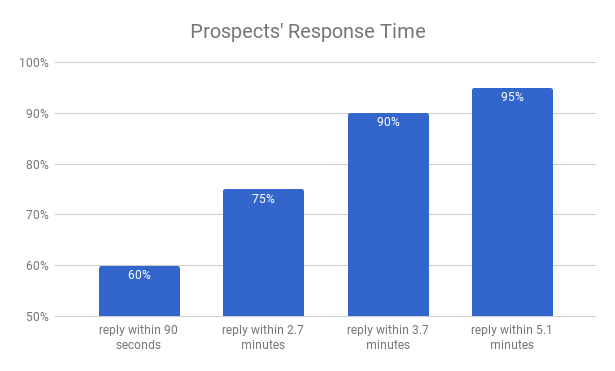 Equally impressive, 9 in 10 applicant prospects’ responded by text message in less than four minutes. There is a convenience factor in play when it comes to offering text messaging for your customers. Leading financial services companies, including Susan’s, are recognizing the benefits of this convenience factor with a higher level of customer service and efficiency. Email and telephone will not disappear but will continue to be less prevalent in day-to-day communication when comparing these mediums with text messaging for banking. If traditional banking institutions want to remain leaders, they are going to need to act and diversify their modes of communication.